Summit Professional stainless steel 24 inch model TTM630279BFKWY. 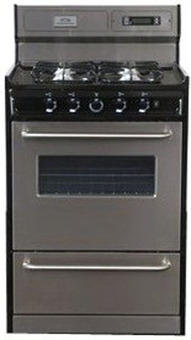 This model is made in the USA, and has much larger ovens than most competing products. The oven itself is fully porcelain, as are the tops, manifolds and burner boxes. The stainless steel range also has oven windows and lights, and clocks with timers. This gas model has sealed burners and electronic (spark) ignition. The Summit Professional Series TEM630BKWY 24″ Freestanding Electric Range with Electronic Ignition & Deluxe 8″ Backguard: Stainless Steel is available through Amazon.com.